Book Horde: Kid Heading to College? Get Half Off Amazon Prime ! Kid Heading to College? Get Half Off Amazon Prime ! 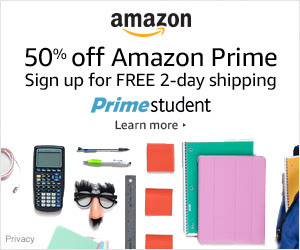 If you have kids heading to college or already in college, you should really think of taking advantage of Amazon's 50% off discount on Prime. Basically your kid just needs a college email address to sign up with. It's really handy for free two day shipping, textbook rentals, etc. And since there is no user limit on Prime streaming, both your student and the rest of the family get to watch Amazon Prime streaming video. We have this with our college kid and it is really convenient and I think a really good deal.